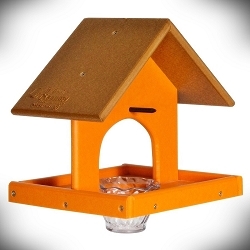 The Rubicon Recycled Plastic Mealworm Feeder features an environmentally friendly design and will surely last for more than 100 years as it is made from recycled plastic milk jugs. 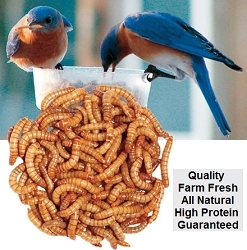 This feeder will not fade, peel, rot, crack, chip, or warp. Proudly made in the USA! 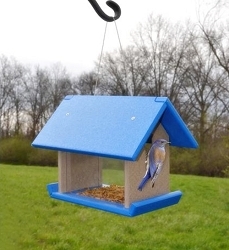 The Mealworm Feeder's unique design provides bluebirds and other small birds with a protected feeding haven. 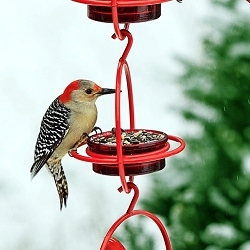 Starlings and other large birds are unable to enter the feeder through the 1.5" diameter holes while smaller birds enter the feeder freely to dine. 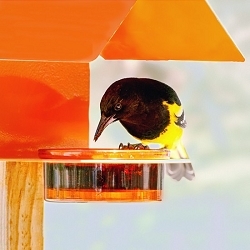 Extended perching on the feeder ends provide birds with comfortable resting stations. 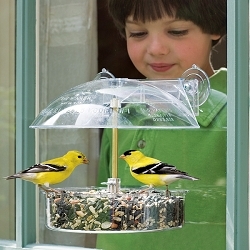 The clear plastic reservoir windows keep the feed level and birds visible at all times. 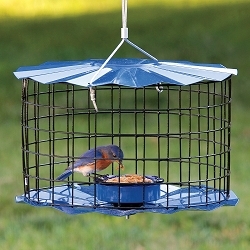 The feeder reservoir is perfect for offering fruit, berries, insects, mealworms, and everything else that bluebirds and other small birds love. 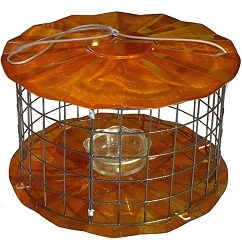 The feeder roof is hinged to make filling the feeder convenient and one reservoir panel may be removed for thorough cleaning. 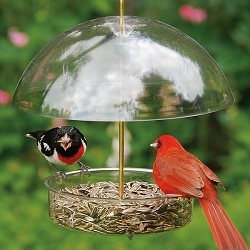 This feeder's durable construction will make it a practical addition to your birding sanctuary for years to come. 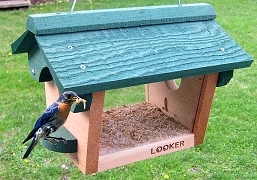 This feeder may be hung using the included steel cable hanger. 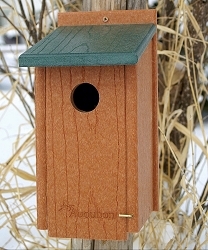 Rubicon manufactures high quality, environmentally friendly eco-birding products featuring PVC and polylumber. 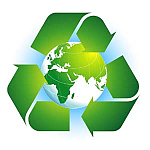 Polylumber is a state-of-the-art product consisting of post-consumer bottle waste such as milk jugs. Unlike wood, it doesn't fade, crack, split, chip or rot. Partnering polylumber with PVC, Rubicon creates innovative, yet traditional, designs in a variety of colors. All products carry an unconditional lifetime guarantee, even on squirrel damage!